The bright, comfortable restaurant prides itself on serving traditional Lebanese dishes with “awareness and concern regarding health and nutrition,” according to the menu. Many items are suitable for vegetarians and even for vegans, and there are gluten-free options, as well. Two people on a tight budget of $20 — the meal plus tax and tip — can eat very well at Aladdin’s. Whether you’re looking for a snack, such as a fresh fruit smoothie ($3.25) and a cup of soup ($3.75), or a full lunch or dinner, you’ll be able to stay within your financial limits and still enjoy yourself. Even while being careful with your money, you can choose from 11 appetizers, seven pita pizzas, 22 rolled pita sandwiches, six of the salads, or any of the five salad pockets (pitas stuffed with fillings such as chicken salad, hummus, or tabouli). The Mujadara Pocket ($7.45) was so generous that I couldn’t finish it all, and my dinner companion ate a good portion of the dish even after finishing his Spicy Beef Kafta rolled pita sandwich ($7.25). 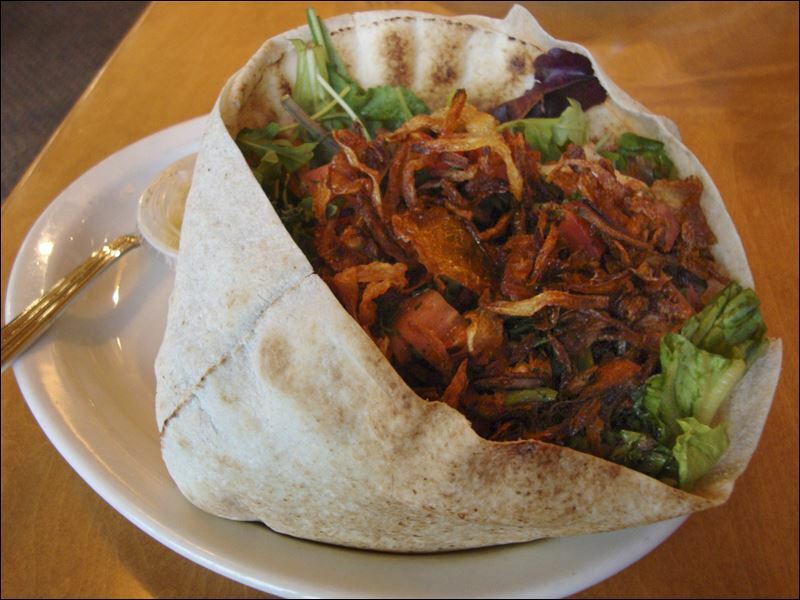 Mujadara is a dish of lentils and rice topped with crispy onions, and it was served on top of fresh mixed greens, all within the pita. 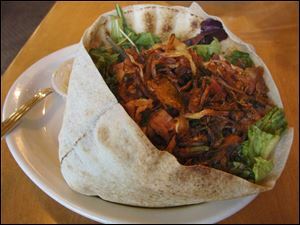 The kafta featured char-grilled spiced beef with onions, herbs, tomatoes, and onions, as well as hot sauce and a tahini yogurt dressing. Our waiter, Ben, was very friendly, as well as patient; it took several visits to the table for us to decide what we wanted, with so many enticing options available to us even while eating on a budget. While Aladdin’s does feature a beautiful display case filled with luscious, rich desserts, it’s easy to eat with health in mind while perusing all the dishes. Such Middle Eastern favorites as grape leaves, falafel, shish kabob, shawarma, and fattoush are all waiting for you. Two people can easily eat for $20 at Aladdin’s Eatery, and still enjoy a hearty, delicious meal. Aladdin’s Eatery is at 4038 Talmadge Rd. For more information: 419-472-8004, aladdinseatery.com.